Born in Vancouver B.C. in 1953, Mark Hobson was fortunate to spend his childhood in many parts of the world. Drawing animals almost every day as a child laid the groundwork for developing skills as a self-taught artist in watercolour, acrylics, and oils. A fascination with natural history led to a degree in biology from the University of Victoria. After nine years teaching high school sciences, Mark moved to Tofino on the windswept west coast of British Columbia to pursue his passion for painting. Working seasonally as a park naturalist at Pacific Rim National Park, the winter months were free for creativity. By 1987 the demand for his work had grown to the point where he decided to paint full time. He now paints from his floathouse studio and his paintings have gained recognition all over the world for their vibrant depictions of the remote shores and wildlife of the Pacific Northwest. Whether the subject is underwater or deep in the rainforest, the careful use of light is always present to convey a sense of mood in his work. A strong advocate for preserving the wilderness he loves to paint, Mark has donated many paintings and much of his time to environmental concerns. He was a driving force in the campaign to bring artists to the Carmanah Valley in 1989, which resulted in an award-winning book and the eventual formation of a new provincial park for b.c. In recent years he has been invited to show his work in Hong Kong, Singapore, Europe, and across the u.s. In 1996 he was named British Columbia’s wildlife artist of the year and was selected in 1997 as a member of the Society for Animal Artists. In 1999 he was asked by the Royal Canadian Mint to design a set of wildlife platinum coins. His acrylic painting, “Harlequins: On the Edge” was selected by the Society of Animal Artists as one of 45 pieces displayed on the 2000-2001 tour of major U.S. cities. National Geographic Head Office in Washington D.C. has chosen the painting as a featured piece in an exhibit of wildlife art on display from June to September 2002. 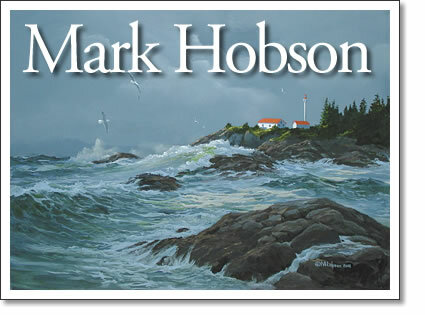 Tofino artist Mark Hobson moved to the west coast of Vancouver Island to pursue his passion as a wildlife painter, after teaching highschool sciences for 9 years.